We promise to provide you with exceptional care as we enhance the health and natural beauty of your smile. Below are just some of the many procedures and services we regularly provide to our patients with a gentle touch and commitment to excellence. Improved equipment has made our periodontal treatment more comfortable than ever. We use a computer controlled local anesthetic delivery system providing practically painless anesthesia. Because needs for pain control may vary, there are several medications we can prescribe as pre-medication to help you relax and be more comfortable. In addition, we offer General Anesthesia (deep sleep) which is administered by a certified anesthesiologist for more involved surgical procedures. Our sterilization procedures meet Center for Disease Control Guidelines. We sterilize all instruments and handpieces in an autoclave, and use ADA approved disinfectants. Routine sterilizer monitoring is done on a regular basis to verify proper use and function. Gloves, masks, and glasses are worn for each procedure. Research has connected severe gum disease with serious illnesses such as heart disease, stroke, diabetes complications, preterm, low birth weight infants, and increased risk for pancreatic cancer and tongue cancer. Periodontal disease can be treated and prevented, and now can be reversed by regrowing supportive structures of teeth lost to periodontal disease with regenerative procedures. 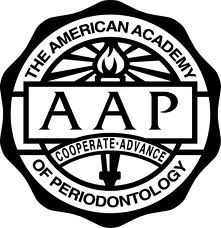 Scaling and Root Planing with Local Anesthetic: Removal of disease-causing bacterial plaque and tartar in infected pockets around teeth and root surfaces using specialized instruments. (This is different from routine preventative dental cleanings). Local Antibiotic Treatment: Placement of a time released antibiotic directly into infected pockets to disinfect the pockets. This is performed to enhance effects of scaling and root planing or when a localized pocket is found during a routine dental cleaning appointment. Surgical Pocket Reduction: For more advanced forms of gum infection-when the infection has gone into the bone which supports your teeth, and is deeper than the level that can be reached with specialized instruments. A gentle minor surgical procedure is completed to remove the infection in deeper pockets. Guided Tissue Regeneration: Regenerative procedures to reverse effects of periodontitis, to "regrow" gum and bone tisse to save natural teeth. For teeth that are broken down below the gumline. Sometimes there is not enough tooth structure above the gumline for your dentist to prepare your tooth for a crown. This procedure provides more tooth structure for your crown, enabling more retention and healthier gum around the crown. A minor surgery is gently performed to adjust the gum and bone level to expose more of the tooth so that your dentist can repair damaged teeth. Exposed tooth roots can make teeth look longer and appear unsightly. Tooth sensitivity can also be increased. A gum tissue graft is gently placed over the area to cover exposed roots, protect from decay, reduce tooth sensitivity, prevent further gum recession, and improve esthetics. After teeth are lost, the bone shrinks down, causing a "shrunken" unsightly appearance under bridges, and insufficient amount of bone to support dental implants. A gentle minor surgery is performed to augment/fill the area with a bone graft to improve esthetics, and for future dental implants, provide a stable foundation to increase longevity of dental implants. Modern advances in dental science allows us to offer safe, successful and proven nonremovable tooth replacement that looks, feels and functions like natural teeth. An artificial tooth root is placed in your jaw to hold a replacement root or bridge in place. Please see our special section on Dental Implants. We regard the maintenance of your oral health as the most important service we provide. We emphasize educating our patients in effective homecare maintenance techniques and provide regular preventative office recare visits with oral cancer screening to promote superior dental health and lifetime benefits. Without careful, ongoing monitoring and treatment, periodontal infection can recur. In addition, dental costs are kept down by preventing future problems.